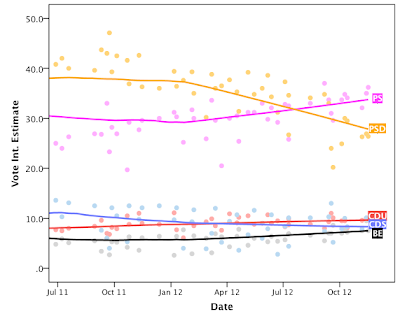 It would be interesting to know the evolution of the numbers of "intend to vote" "do not intend to vote"
I would like to see also another graph - or a table - taking the past 5 elections or so, how long it takes until the winning party stops being the one receiving the highest vote intention in polls. 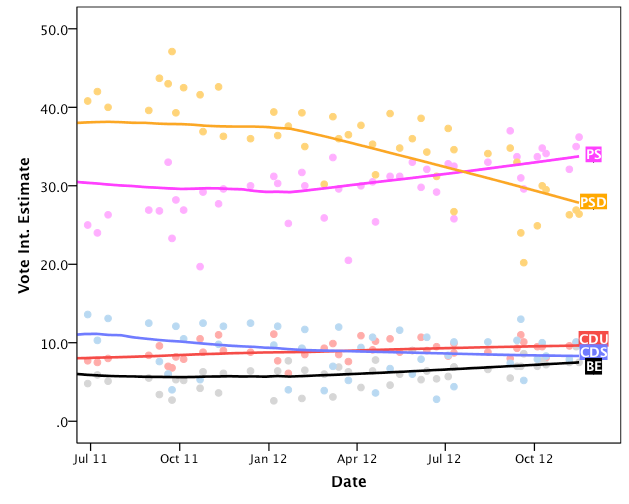 From the 2011 election it took roughly a year; from the 2009 election (picture in an earlier post from you, it sounded slightly less than a year), from the 2005 election there was no reversion, and prior? Pedro, only now I realized you had a comment here. The response to your question is unfortunately easy: prior to 2005, I have no data! But that is being taken care of as we speak in a project here at ICS.